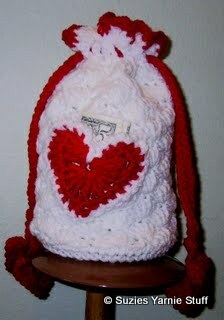 Adorable -- makes me wish I had a little one to make it for! Please clarify the abbreviation "tc"
Sorry for my inconsistancy. It is treble crochet. Thanks, I love reading that people like my patterns. I love the bag pattern. Made one for my grandaughter, now my other grandaughter wants one. I found this w/ the help of Jo NY ( I saw it on her myspace pics page) and thought it cute...so I decided I'd try it out- using # 10 thread and 4 steel hook. I like the way it came out-- will experiment with other sized needles-but they will make great sachet or wedding favor bags! Thanks for sharing your pattern! I will have to give the thread a try. Would be fun for a gift bag for jewelry too. For CD do you mean a computer disc? Yes a computer disc. It could also be a music CD. Or the bag can be made without the CD if you don't have one available.